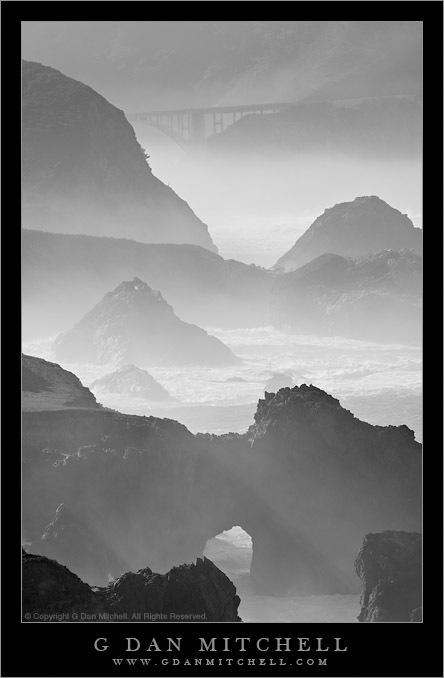 Rocky Creek Bridge, Surf and Fog. Big Sur Coastline, California. February 9, 2008. © Copyright G Dan Mitchell. I went over that direction, but intentionally stayed away from the scene at Mavericks. It was a wonderful day – where I was it was not too cold, but the surf was tremendous and there was lots of interesting clouds, fog, and light. 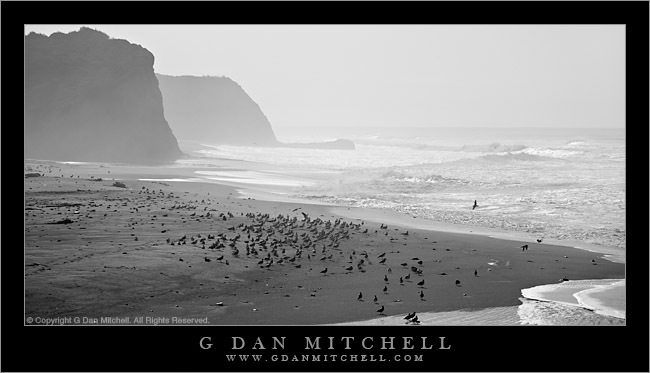 Winter Surf, Gulls. South of San Francisco, California. January 12, 2008. 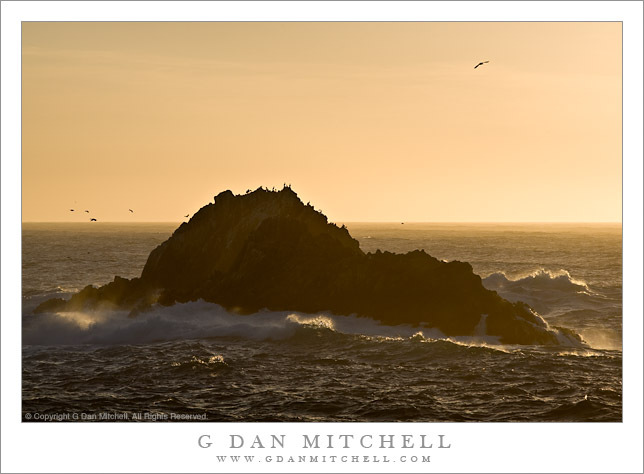 © Copyright G Dan Mitchell. 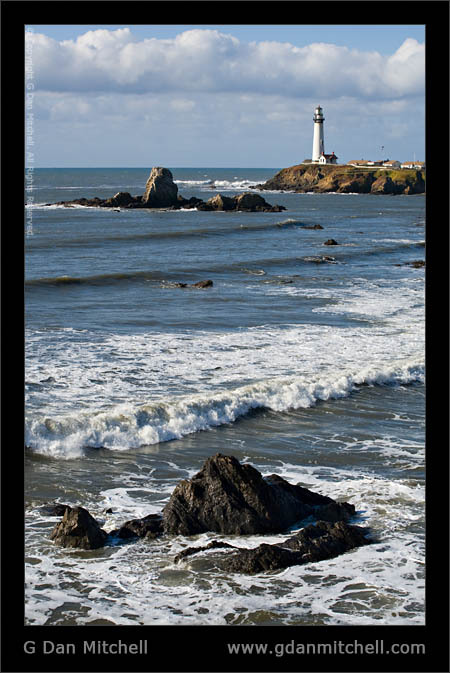 Winter Surf – Pacific Ocean. South of San Francisco, California. January 12, 2008. © Copyright G Dan Mitchell. If you go there soon, you’ll find a few others at my Flickr site. 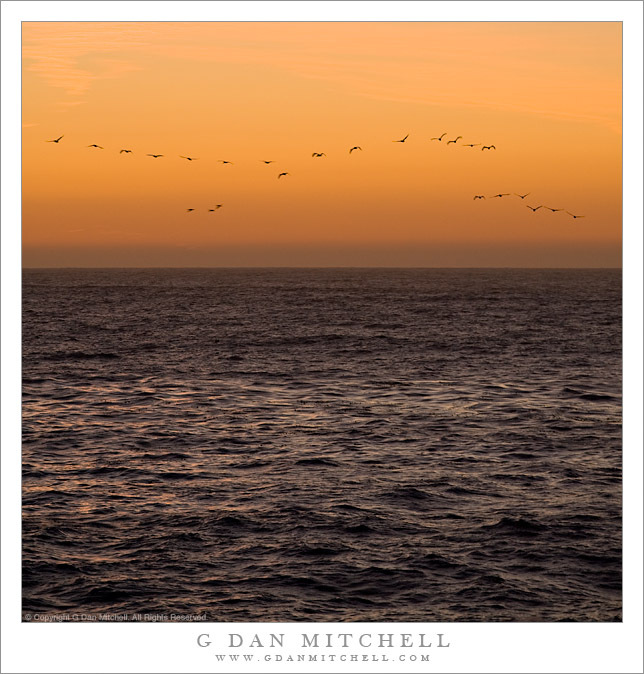 Pelican Flock, Dusk. Point Lobos State Park, California. December 30, 2007. © Copyright G Dan Mitchell. The last photo of the day from yesterday’s visit to Point Reyes National Seashore. 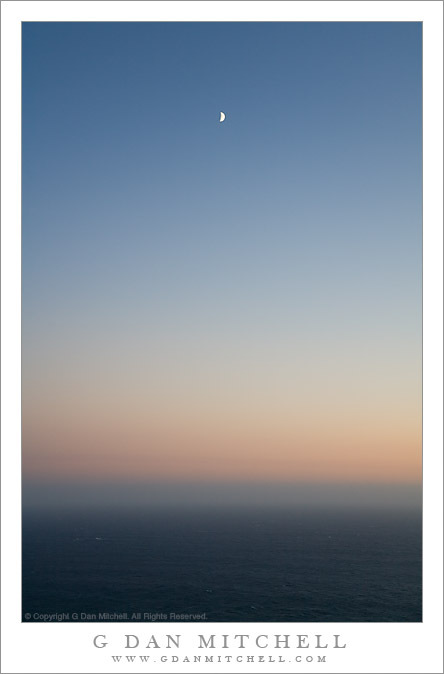 September Moon, Pacific Sunset. Point Reyes National Seashore, California. September 18, 2007. © Copyright G Dan Mitchell. You’d never know it from this peaceful image, but the wind was blowing so hard I could barely stand up straight! Early Morning, San Francisco Bay. July 17, 2006. © Copyright G Dan Mitchell. Not exactly my usual story for this web site, but yesterday I went on a San Francisco Bay Area urban adventure. Since it was a “Spare the Air Day” due to heat and smog, all of the transit systems in the Bay Area were offering free rides – this included buses, trains, ferries, light rail. I decided to take advantage of the situation and head to San Francisco without the need to worry about driving or parking. I picked up a free bus across the street from my home, and less than 10 minutes later I was getting on a free CalTrain “Baby Bullet” commuter train to San Francisco. I got off the train in San Francisco at almost exactly 7:00 a.m. and quickly got on a free muni train along the waterfront. I quickly realized that I would have a lot more interesting photography opportunities on foot than on the train, so I got off two stops later and began walking north along the waterfront. I stopped to investigate the Ferry Building and discovered that, yes, the ferries were also free today – so I took a gratuitous free ferry across the north bay to Larkspur and back. After returning I resumed my walk along the waterfront, eventually getting beyond Fisherman’s Wharf. At this point I turned around, walking back to pick up the free historic trolley running back along the waterfront. I rode this to near the Ferry Building and finally walked the last part back to the train station and my trip home. Pacific Ocean Near Pigeon Point. March 17, 2006. © Copyright Dan Mitchell. Pacific Ocean. Near San Gregorio State Beach. February 3, 2006. © Copyright Dan Mitchell. Birds, Surf, Sand. Davenport Landing. January 14, 2006. 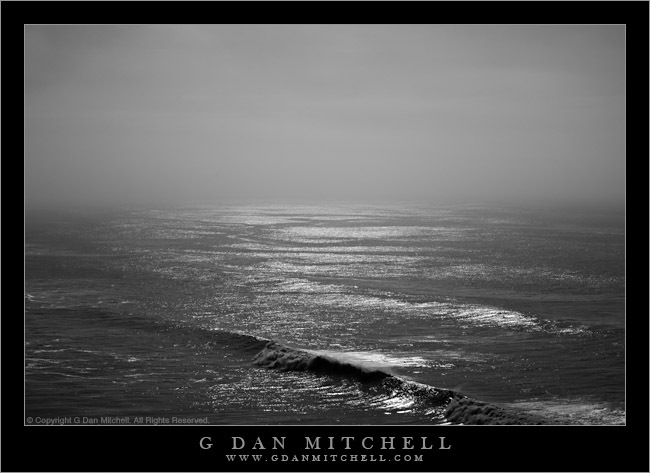 © Copyright Dan Mitchell.